Can an Android tablet actually stack up to the iPad? Should I buy a Huawei MediaPad M5 Pro or an iPad? When we're talking about tablets, there are basically two markets: Apple's iPads and everything else. But in the everything-else bucket, there are a couple of standouts, and the Huawei MediaPad M5 Pro is certainly one of them. 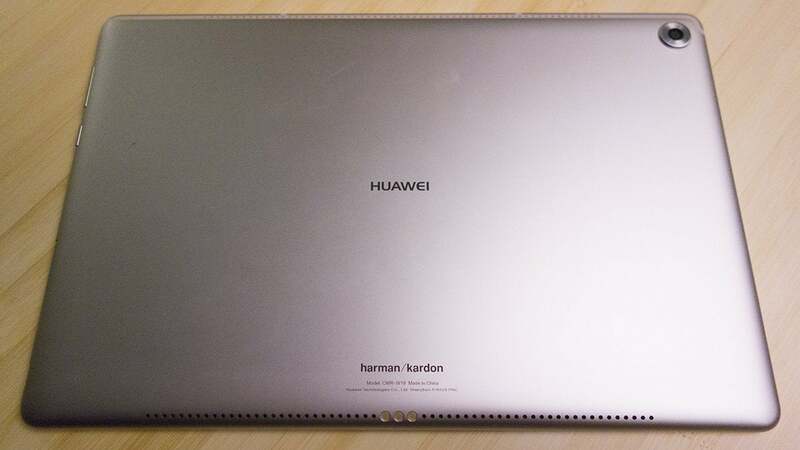 With a 10.8-inch screen, stylus support, and a Pogo pin connector for attaching a keyboard along with a $449 price tag, Huawei is targeting both the 10.5-inch iPad Pro and the latest 9.7-inch iPad with the MediaPad M5 Pro. So is this the affordable pro tablet Android users have been waiting for? Let's see how it stacks up against Apple's newest tablet. The screen, LTE support, and bundled M-Pen make the M5 Pro a fantastic value. Plus the MediaPad has 64GB of storage—the same as you get on the iPad Pro and twice that of the 9.7-inch iPad—along with a microSD slot for expandable storage. Granted it might be too much tablet for some people, but if you need the LTE, storage, and stylus, the MediaPad M5 Pro is easily the better value. The MediaPad has a clean, minimal design with soft edges and smooth curves. It's not just that it's bigger. While it actually looks and feels far thinner than it actually is, the MediaPad's elongated size makes it a bit awkward to use, particularly in portrait mode. When holding it in landscape mode, however, the 2.5D (curved-edge) glass and chamfered edges rest nicely in your hand. 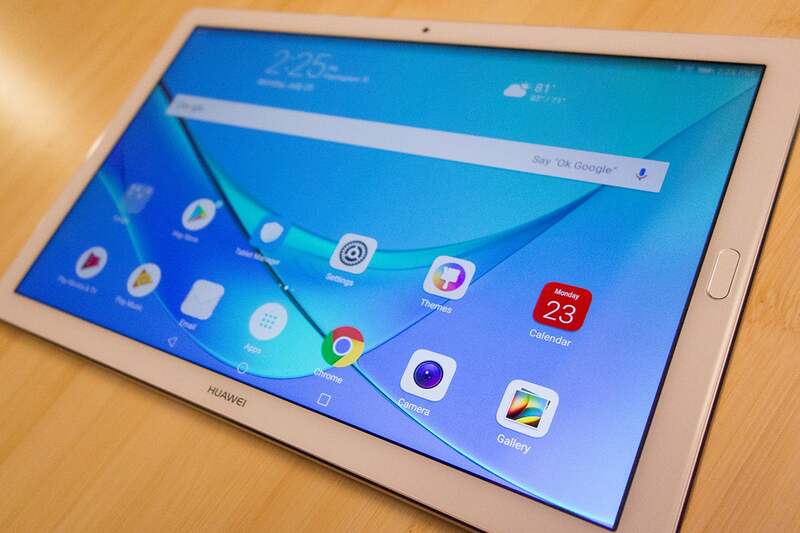 The MediaPad M5 Pro comes in one color scheme—gold with a white front—where Apple offers more options, with silver, space gray (with a black front) and rose gold—but overall, Huawei has built a tablet that feels just as premium as the iPad. The bezel designs are also distinctive because of design choices. The iPad has a thick bottom bezel to accommodate its circular home button, but its side bezels are thinner. An oval-shaped home button means the MediaPad M5 Pro can have a smaller chin than either iPad has. Huawei's decision to make the bezels the same thickness, however, makes the tablet look a little clunkier on the sides. It's a tradeoff that I didn't love (plus I could have done without the Huawei logo in the center of the top bezel). The chin on the 9.7-inch iPad (right) is much bigger than it is on the MediaPad M5 Pro (left). Around the back, the two tablets look strikingly similar, with some notable exceptions. Like the iPad, the MediaPad M5 Pro's back panel houses a 13MP camera in the top right corner with a sizable bump, while Apple's is on the left. Otherwise, the M5's back is just as clean as the iPad. A pair of long grilles along the top and bottom edges house four speakers, similar to the iPad Pro. There's no headphone jack, but it comes with a USB-C-to-3.5mm adapter. The USB-C port is oddly positioned at the far left of the edge below the home button, which is also where you'll find the power button and volume rocker, which take some getting used to. In contrast, Apple keeps it simple with the 9.7-inch iPad: There's a Lightning port and speaker grille on the bottom and a headphone jack at the top. But the real difference is with orientation. While Apple's tablets skew toward portrait mode, the company's mostly content to let the user decide which way to hold the iPad. Huawei, on the other hand, clearly wants you to use the MediaPad M5 Pro in landscape mode. The home button might beckon you to pick it up in portrait mode, everything else about it is made for wide-screen use, from the placement of the selfie camera and the logo, to the buttons and screen ratio. It's a nice design, but holding the M5 Pro in portrait mode for any extended amount of time is seriously awkward. The display on the MediaPad M5 Pro is wide and wonderful. 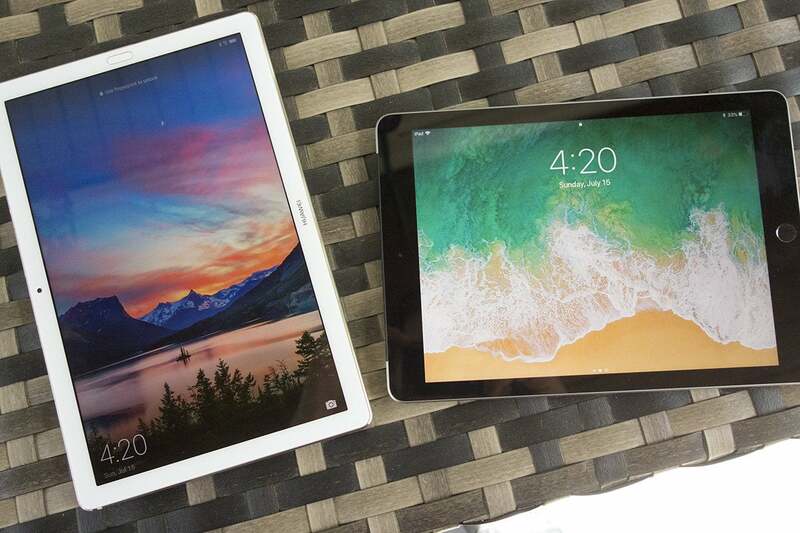 The iPad and MediaPad M5 Pro both use IPS-like display technology, and it's hard to spot much of a difference between them. The iPad Pro's True Tone display and ProMotion feature stand alone and add an extra element in certain lighting and situations, but when comparing it with the 9.7-inch iPad, the overall clarity and brightness on the MediaPad is superior to my eyes. Colors popped without being oversaturated. Even at full brightness, I was able to use it for long amounts of time without straining my eyes. The wide screen makes a real difference when watching movies. 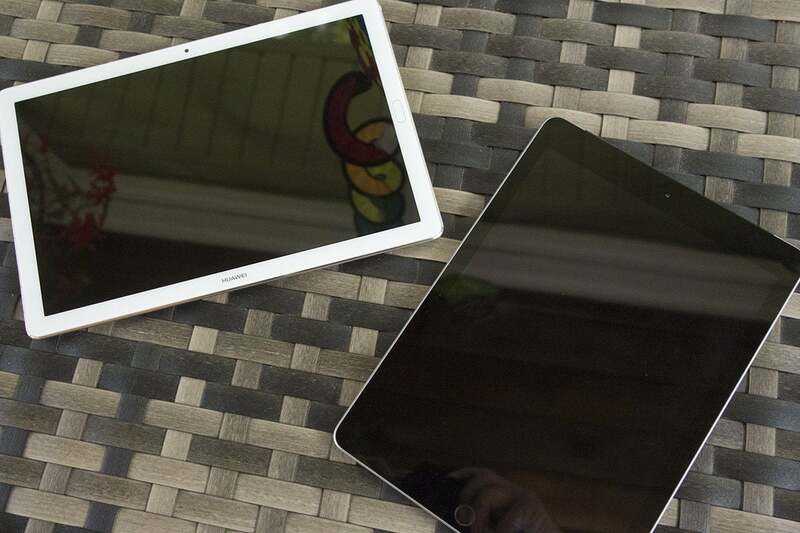 Both tablets use home-grown and home-optimized chips. 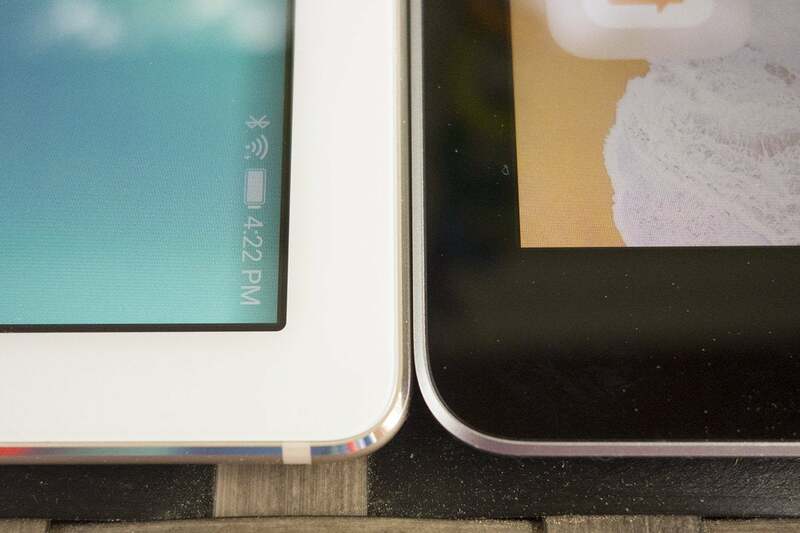 Both tablets use homegrown processors rather than Qualcomm's popular Snapdragon chips. 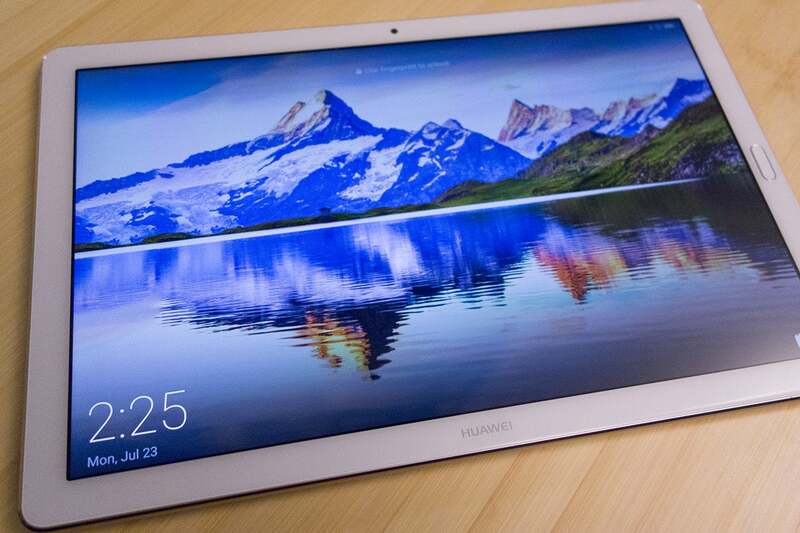 The MediaPad M5 Pro gets a special "s" version of Huawei's last-gen Kirin 960 octa-core chip. Curiously, it's actually slower than the original chip, running at 2,100MHz rather than 2,400MHz, so I suspect the tweak has more to do with power efficiency than performance. As such, battery life is also stellar. The MediaPad M5 Pro includes a massive 7,500mAh battery that lasts for several days of normal use. Huawei rates it for 12 hours of 1080p video playback (two hours longer than the 10-hour iPad), and you'll definitely be able to squeeze in a more after a full day of heavy work. I consistently had more battery left on the MediaPad after performing two simultaneously draining tasks. More importantly, I didn't encounter any of the tell-tale lag that so often afflicts Android tablets. If given the choice, I'd rather the MediaPad had used the Mate 10 Pro's Kirin 970 processor, which brings AI processing and superior power efficiency, but the 960s seems more than capable of handling moderate tasks. 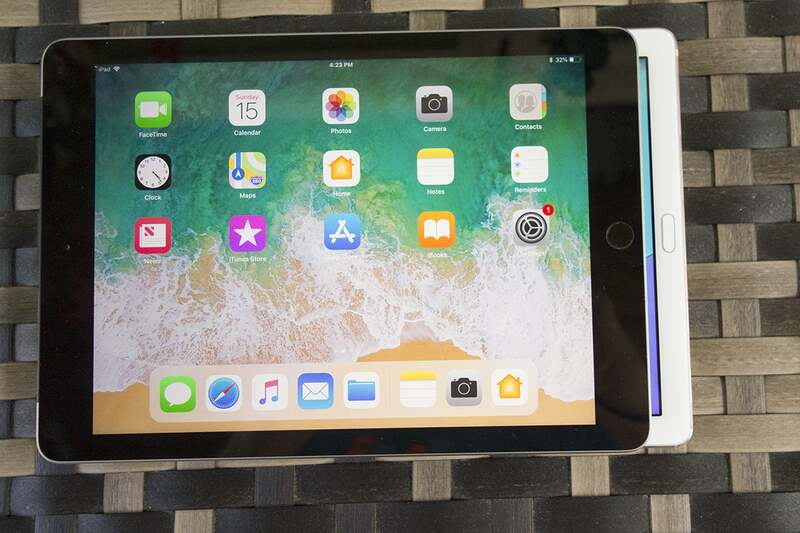 Apple's 9.7-inch iPad also runs a previous-generation A10 Fusion chip, but the speed differences are minimal between it and the newer A10X Fusion chip in the iPad Pro. Thanks to iOS optimizations, apps and animations fly on Apple's iPads long after their shelf life has expired. It remains to be seen if Huawei's chip can stand up to years of use. Benchmark scores skewed heavily in favor of the iPad, but out of the box, both are more than capable of handling a healthy dose of work and play. The iPad's library of apps runs eclipses the offerings on Android. The MediaPad M5 Pro runs an older version of Android Oreo (8.0 rather than the newer 8.1), but you still get the best features, including picture-in-picture and notification dots. Like its phones, Huawei skins Android with its own EMUI interface, but it's much more palatable on the larger screen. There are a few bloatware apps (Booking.com, Facebook, etc. ), extra Huawei apps (HiCare, Kids Corner), and unnecessary Android duplicates (Email, Gallery). For the most part, however. Huawei's OS is well suited for the larger screen. And like the Mate 10 Pro, the M5 has a fantastic lock screen that displays a rotating series of gorgeous images. The bigger issue is the apps. While Apple's App Store is crammed with apps, games, and utilities that take full advantage of the iPad's large screen in either orientation, Android developers have yet to fully embrace the tablet experience. As a result, most of the apps on the MediaPad M5 Pro feel like blown-out phone apps rather than powerful tablet ones. Even Google's apps are lacking the big-screen polish of Apple's, and the experience suffers as a result. One of the biggest reasons for Android tablets' struggles is that the OS never embraced the possibilities, and that hasn't gotten any better with Oreo. From the gestures to the multitasking, everything on the iPad feels more powerful and intuitive. Using it side-by-side with a 2018 Android tablet only highlights how far behind Google's OS is. The pen is mighty! Read on for a comparison of the Apple Pencil and Huawei M-Pen styli, camera, and more. Great symmetrical design that accentuates the screen. Excellent display that's perfect for watching movies. Bundled stylus lets you draw with ease and precision. No screen expanding with HDMI cable. Wide design can be a little awkward to hold in portrait mode. Android's app ecosystem for tablets leaves much to be desired.